Have you considered getting into Project Life and pocket scrapbooking? Are you intimidated about how to start Project Life? Are you already a die-hard Project Life Fan Girl and want more stuff? then I have a GIVEAWAY for you! The Project Life/Pocket Scrapbooking community is generous bunch. On all of the Facebook groups, message boards, etc there is always a thread going on about someone wanting to do a RAK (random act of kindness). This means they want to give away scrapbook goodies to some lucky soul! Whether it means they are just clearing out items they won't use, making room for new goodies or just spreading the wealth this means good things for everyone! It creates such a nice vibe among the community. Well, now you have a chance to enter to win a RAK from me and many others on The Pocket Source. They have launched a new Groups feature and and RAK Group, too! If you haven't already started an account at The Pocket Source, do so now. It's a fantastic way to get inspiration for pocket scrapbooking layouts and new products from designers (like the fabulous Deena Rutter). Once you have enrolled friend me! No, really! I want to see what you do, too! Then, join the RAK Group. You may then browse all of the photos to see what everyone is offering up as a RAK. You may comment on up to 3 items for a chance to win. Winners will be randomly selected on April 7th, 2014 shipped that same week! Here is what I am offering. I went a little nuts clearing out some of my stash. 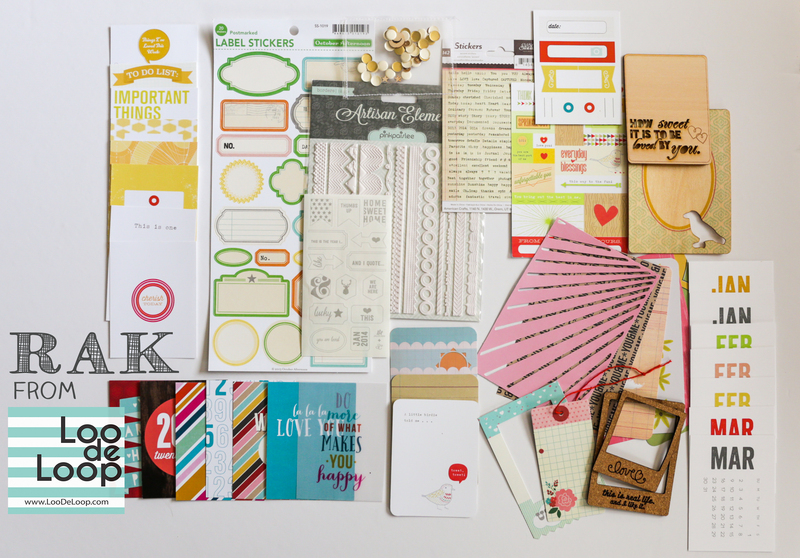 Tons of 3x4 and 4x6 cards, goodies from Studio Calico kits and Gossamer Blue, wood veneer cards, a handmade sequin pocket, stickers, cork frames, labels and more! So, go on and enter to win! What have you got to lose? ?